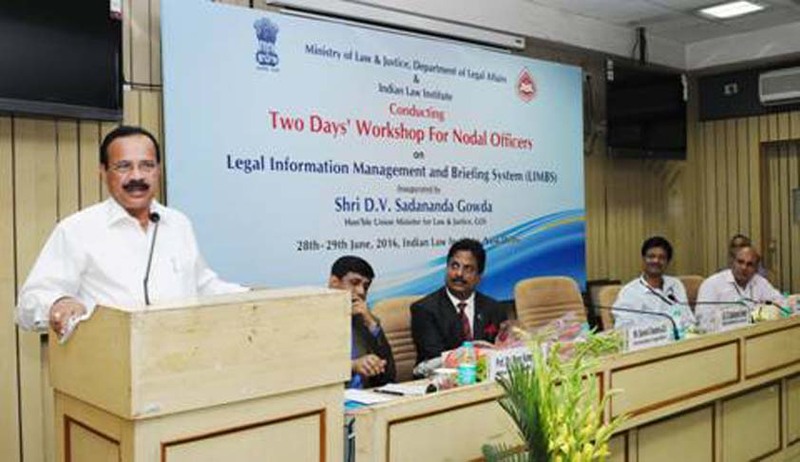 A two day workshop for nodal officers of all the ministries to provide hands on training on its ambitious Legal Information Management & Briefing System (LIMBs) began here in New Delhi. Inaugurating the workshop Union Law & Justice Minister Shri D.V.Sadananda Gowda said his ministry as conscience keeper of the Government, has taken several initiatives which include cleansing of statute book by repealing the obsolete and redundant laws; taking the Digital India Mission of the Prime Minister forward through NDSAP; computerization of courts, introduction of e-office etc., bringing amendments in the Arbitration and Conciliation Act, 1996; enacting Commercial Courts, Commercial Divisions and Commercial Appellate Divisions of High Courts and developing a web based application for the digital monitoring of court cases i.e. LIMBS. With the objective of achieving 'Minimum Government andMaximum Governance', and 'Ease of Doing Business', the above-mentioned efforts have been initiated which will help in enhancing the Transaction Governance Capacity (TGC) of the State. The Transaction Governance Capacity, among others, has two important components; (i) legal framework and (ii) resolution of disputes. Shri Sadananda Gowda said under Digital India programme, a number of initiatives have been taken up which include, e-courts, LIMBS and digitalization of other court activities. He opined that there is a need to initiate collaborative, unrestricted information flow and provide a National Data Grid which has all the information, and where data mining & its analysis is possible. The Minister said LIMBS is one of the progressive steps taken by the Ministry of Law and Justice in the direction of Digital India. It is in line with Prime Minister's vision of Digital India to digitalise the details of court cases and brings various stakeholders on a single platform. This will not only help to introduce transparency but also a sense of ownership among various stakeholders during the life cycle of a court case. Among others, it will help authorities to take 'data driven decision making' and to evaluate performance of various stake holders and to conduct legal audit. He said this is a simple, user friendly and innovative web based application with robust architect which digitalises all the processes of a court case. LIMBS helps in monitoring court cases in a transparent manner which has never been done before. Shri Sadananda Gowda expressed the hope it will help in organizing otherwise scattered information at one single database and also create a professional base which will help in building pool of experts available for expert advice among various other benefits that LIMBS is aiming at. Also with a concurrent watch and regular monitoring of the court cases by the senior officials, the transparency and accountability will improve, and thus all the Ministries mustmake an attempt to ensure that none of the cases goes unnoticed. E- document vault of LIMBS, a value added feature,can bring a good repository of past data to improve the decision making. Group SMS may be utilized to sensitize the concernedofficials to make them responsive and proactive. LIMBS provides a low cost web technology access to all the stakeholders involved in a court case in a coordinated waywhereby it provides inputs which are available seamlessly on 24x7 basis as per the defined access rules. This way, it is possible to know the various stages of a case and monitor its progress on a continued basis through an elaborate set of user friendly reports. The Minister noted with satisfaction that out of 55 Ministries, 41 Ministries have taken initiatives to upload cases on LIMBS. Around 56 Nodal Officers have been designated. 200 Departments and attached bodies have around 4000 registered users. More than 75000 cases have been uploaded on the LIMBS. Besides this, around 8000 advocates/counsel have been updated on the LIMBS portal. He said since LIMBS aims to reduce financial burden, save time and bring efficiency in the working of various Departments of a Ministry., hence those Ministries, which are yet to adopt LIMBS model into their system, should also take the initiative in adopting the same to bring more coordinated approach in working of the Government. Data entry of Ministries, attached offices and subordinate offices must be completed as early as possible in a time bound and integrated manner to expect the desired results. Earlier, welcoming the Minster Shri Suresh Chandra, Secretary, Department of Legal Affairs, Ministry of Law & Justice also gave an overview regarding LIMBS and its journey. A detailed technical presentation on LIMBS was also made by Shri Ajay Gupta, Dy. CVO, Northern Railway who has designed and developed the application. On this occasion two brochures “Legal Information Management & Briefing System (LIMBs)- Complete Web Solution to Legal Cases…..” and “Legal Information Management & Briefing System (LIMBs-Role of Nodal Officers” were also released.